Famicom Meijinsen (ファミコン名人戦, Famicom Meijinsen? lit. 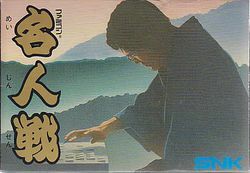 Famicom Shogi Pro Tournament) is a Shogi game developed by Alpha Denshi for the Famicom, and published by SNK in 1988. The player is an entrant of a tournament with a diverse cast of participants. The player can raise through the ranks by playing against each of them or spend some time familiarizing themselves with the rules and tactics of Shogi in the training mode. The Japanese board game Shogi (将棋) is a game very similar to the western game of Chess. There are many similarities, but there are some noticeable differences as well. While chess is played on a 8x8 board, Shogi is played on a 9x9 board. In chess, there are 16 pieces for each player; Shogi gives you 20. Gameplay is on a turn by turn basis; that is, after one player makes a move, the other one goes, and so on. There are two colors, white and black, with black always going first. Press to select a piece, use to move it, and then press again to finalize your move. Pressing cancels anything in mid-turn. switches the cursor to the defeated pieces table. Pressing returns you to the main menu. You can continue any in-progress game with the fourth option. Pressing during a game will bring you back to the sub-menu of the modes. When you play the game, the main feature to notice is the game board in the middle. Getting used to that is another matter, read the board basics section for that. What is more important for you to adapt to the game is the rest of the layout. At the top are two timers which display the time used for thinking by each player, the left being the top player and the right for the bottom player. The number on the bottom left is the current number of moves and the last move description. The small tables in the left and right right corner are for defeated pieces. Finally, a small display at the bottom is for current messages, such as "thinking" or "your move". If you do not understand Japanese then simply ignore it and they are usually self-explanatory. Choose the leftmost mode to play an original game of Shogi. 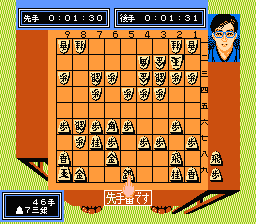 There are three sub-menu options which are playing a game of Shogi 対局1 or 対局2. The first choice lets you play against a CPU opponent and the second choice is for 2-Player mode against another human player. That person will take their seat with the second controller. The game immediately starts in 2-Player mode, but you must first select your opponent if you choose to play against the CPU. The final mode, 観戦, is watch mode. Pick two CPU players to pit them against each other and watch how they do. You can use this to learn strategies, opening moves or just pass the time for your enjoyment. 1-Player mode comes with a few options to select from. There are two rows, the first is for your handicap (平手 Equal, 角落 Bishop omission, 飛落 Rook omission, 飛角落 Rook and Bishop omission, 飛角香落 Rook, Bishop and Lance omission) and the second for your color selection (後手 White Player, 先手 Black Player). The second mode is a problem solving game. There are three different pre-set puzzles, either three pieces, five pieces, seven pieces or you can make your own puzzle. The third mode is the league. There are three different leagues you can choose which feature different opposition. You have to beat them all to win the entire tournament. The rightmost option is return, which allows you to continue a game you started earlier. NOTE: The "@" symbol in the diagrams below is meant to signify where the piece in question can make a valid movement in a turn. It should also be noted that in the diagrams below, "up" means forward, down is "back" and so on. This piece is the most important one in the game. You must protect it since if it gets trapped by enemy pieces, you lose. It can move one square in any direction per turn. You only get one of this piece, which is on the right side of the second row. It can move as far as it wants in the four directions (up, down, left, right). Like the Rook, you only get one of these pieces as well, and it is on the left side of the second row. It can move as far as it wants in the four diagonal directions. There are two of these pieces, starting on either side of the King. Its movement is interesting, in that it can move one square in each of the four directions, plus it can move in the two forward diagonal directions, but it can not move diagonally backwards. Like the Gold General, you get two of these as well, and they start next to each Gold General. The Silver General has even more limited movement and a unique pattern, in that it can move one square diagonally in four directions or directly forward, but not directly to the sides or backwards. This piece is just like the piece of the same name in regular chess. You have two of them, starting next to each Silver General. It is the only piece that can pass over other pieces without capturing them. As for its movement, it can go forward two squares, then one square to either the left or right. It cannot move to the sides or backwards. These are the final two pieces, which occupy the corner positions in the back row. The Lances are very limited, in that they can only move directly forward and that's it. You will get nine of these bottom-rank pieces, which occupy the entire third row. Pawns can only move forward one square per turn, that's it. Unlike regular Chess, Pawns can capture enemy pieces by moving forward; diagonal movement by this piece is not allowed. As in Chess, if you move any of your pieces to the opposite end of the board, they can be promoted. In Shogi, this does not only apply to Pawns; it can apply to every piece (except the King and Gold General). A piece is valid for promotion if you move it into the back three rows of the board (the three rows that the enemy pieces initially occupy). When you promote a piece, it gains more movement options, depending on the piece. Also, when you get to the opposing side's three rows and choose to promote the piece, you flip the piece over to reveal its new "name". These names will be listed below. Keep in mind though, that you don't have to promote a piece because you are in the three back rows. If the promoted piece is a Silver General, Knight, Lance, or Pawn, its upgraded movement will be that of a Gold General. If the piece you are promoting is a Rook or Bishop, it will retain its original range of movement, but it will be able to move like a King would as well. As in Chess, the objective in Shogi is ultimately to 'capture' the opposing player's King. Along the way, as you move your own pieces across the board, you can capture the opposing player's pieces by making a legal move onto the same square that an enemy piece is currently occupying. When you capture the enemy's piece, you put it on a side table known as a komadai (こまだい). You can 'drop' a captured piece onto the board, putting it under your control and thus increasing your active forces. This kind of gameplay can work in your favor (or against you, if the enemy does it) if done at the right times. This page was last edited on 29 August 2014, at 22:01.